Ambon (Maluku Reuters) - various handmade leather shellfish and seed pearls are made in a variety of accessories such as earrings, necklaces, bracelets, wall hangings, decorative lights attracted many participants Darwin-Ambon Yacht Race 2012. "First day on Tuesday (28/8) participants who entered the regatta finish Amahusu Village, District Nusaniwe Ambon, Maluku, direct buy various handicraft products of shells and seed pearls I sell as souvenirs," said Edy de Queljoe, one a seashell souvenir sellers in Ambon on Wednesday.It is said, the interest of Australian citizens as participants in the regatta to buy souvenirs from shells very high. This is seen on the first day arrive at the finish immediately bought some kind of souvenir products. "The first day I got 200 thousand of income, from the sale of several types of accessories that are purchased regatta participants Darwin-Ambon. However there is little trouble of having to exchange money with money dollar dollars in the bank," said de Queljoe.According to him, an Australian citizen spending dollars but their use difficult if not exchange it at the bank. So the government should provide facilities Ambon foreign exchange on-site finish. "In no hotel Tirta Kencana finish the Ambon government should work together to open a special counter exchange dollars so they do not bother to bank," said de Queljoe.Explained, the price it sells accessories ranging from Rp 40 thousand to Rp 100,000 which is the highest price. 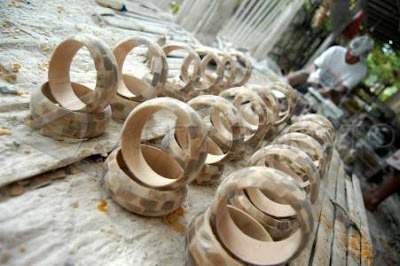 "Earrings and a ring with seed pearl accessories fresh water a bit expensive ie 100 thousand, which was imported from Piru, Capital District of West Seram," he said.He also thanked the organizers claimed regatta Darwin-Ambon, because it can coordinate to sell the products of craft for six days at the finish. 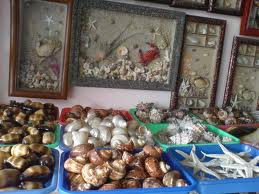 "It really is an annual event Ambon City government, through the Department of Tourism and the appropriate Office of Industry and Trade of the city of Ambon to provide a special place to sell souvenirs. We exist today because of coordinated chairman of the race committee," he said.Therefore, Ambon City Government is expected to next year's activities in order to build a special place for artisans souvenir items. "We've been talking with Mr. Ambon Mayor, Richard Louhenapessy, to build a permanent special place to sell souvenir items as souvenirs for participants of the next regatta," please de Queljoe.